Teens increasingly are getting high with legal drugs like painkillers and mood stimulants, and they're turning to cough syrup as well, says a government survey released Thursday. The annual study by the National Institute on Drug Abuse, conducted by the University of Michigan, showed mixed results in the nation's longtime campaign against teen drug abuse. It found that while fewer teens overall drank alcohol or used illegal drugs in the last year, a small but growing number were popping prescription painkillers like OxyContin and Vicodin and stimulants like Ritalin. As many as one in every 14 high school seniors said they used cold medicine "fairly recently" to get high, the study found. It was the first year that the government tracked the frequency of teens who reported getting high from over-the-counter medicine for coughs and colds. "It's bad that kids are buying cough syrup and using it this way — it's not good for them," said John P. Walters, director of the White House Office of National Drug Control Policy. The study found about one in 10 high school seniors have abused the painkiller Vicodin, and Walters said kids may be pilfering the pills from their parents' medicine cabinets. "That is one thing you can do — take the pills that are no longer being used and throw them away, get rid of them," he said in an interview. Walters credited public service advertising with a steady decrease in overall teen drug use over the past five years. He said the agency would shift some of its 2007 advertising budget toward combating prescription drug abuse. He challenged the recommendations of an August government audit that said the anti-drug advertising campaign wasn't working and suggested Congress consider reducing its funding. The report by the Government Accountability Office found some children were actually more likely to use marijuana after seeing the ads. "We're pushing back," Walters told reporters Thursday as he outlined the study results. "What this shows is we're pushing back successfully." The rise in prescription drug abuse was a troubling conclusion in a study that Walters described as good news overall because of the drop in teen use of alcohol, cigarettes, marijuana and other illicit substances. An estimated 840,000 fewer teens reported using illegal drugs now compared to five years ago, he said. Illegal drug use at all three grade levels dropped, if only slightly. 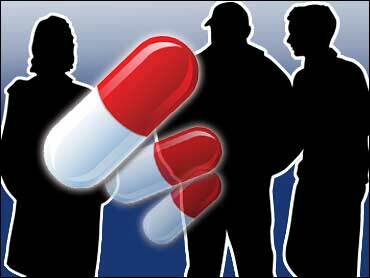 An estimated 36.5 percent of high school seniors reported using illicit drugs at some point in the year. Marijuana remained the single most abused drug among teens, although its use also dropped slightly within all three grades. Nearly 12 percent of 8th graders reported using it, compared to 25 percent of 10th graders and 31 percent of high school seniors. One-third of 8th graders said they had consumed alcoholic beverages, compared to more than a half of 10th graders and two-thirds of seniors surveyed. That also was a small decrease among the three grade levels. But the number of 10th and 12th graders who reported getting drunk increased slightly. Nearly 10 percent of high school seniors admitted to using excessive dosages of Vicodin, a slight increase over the last year. Nine percent of 8th graders sniffed glue, spray paints, cleaning fluids or other inhalants, down slightly. 3.6 percent of 10th graders got high off Ritalin, up two-tenths of 1 percent. Ritalin is used normally to combat effects of attention deficit disorder. That teens are turning to cough syrup to get high is particularly alarming, experts said, because the medicine is cheap and easy to get. Moreover, few people — teens and their parents alike — recognize the dangers of overdosing on the otherwise safe and legal drugs. "There is this mistaken belief that intentionally abusing prescription and over-the-counter drugs is somehow safer than abusing street drugs," said Steve Pasierb, president and chief executive of the New York-based Partnership for a Drug Free America. "What parents don't realize is that this is about your kids taking six pills with a beer."